Fred Macmurray. Barbara Stanwyck. Edward G Robinson. Porter Hall. Jean Heather. Tom Powers. Joseph Sistrom. Film Noir. Peoples' Choice. Classics. 01 Ade tastics. 1940s. Thriller. Recommended. Guardian 1000 Must See (2007). 01 Becky's Bests. AFI Best Film Winners. Thriller. Film Noir. 01 Dave B's must sees. 01 Will's stamp of approval. Dave T's Platinum Picks. 01 Tara's Midnight Movies. 01 Kelly's Heroes. Guardian 1000 Must See (2007). AFI Top 100 Movies Ever. Phyllis Dietrichson is trapped in a loveless marriage to a man who inspires in her nothing but contempt, but rather than leave him Phyllis decides to kill him and collect on the insurance policy she's had set up with the help of her lover, and naive partner in crime, insurance salesman Walter Neff. The only flaws in their plan are the company's reluctance to pay out so much, the diligence of Neff's increasingly suspicious colleague, (and his 'little man'), and the exemplary ruthlessness of Phyllis. 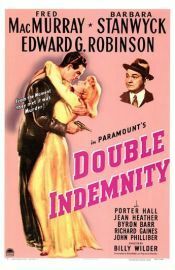 Double Indemnity is the film noir of film noirs; directed by Billy Wilder and co-scripted with Raymond Chandler from James M Cain's novel. Performed to perfection by the three central characters the film still stands, over half a century after its original release, as one of the tightest dramatic thrillers to have ever graced the big screen; dark, cynical, timeless genius.